Caramoan, peacefully situated in the farthest east of Camarines Sur in Bicol, had been creating a buzz ever since it was used as a location for the hit international reality show Survivor. Tourists cannot get enough of the unexploited and secluded group of islands rich with fine white sand beaches, limestone cliffs, caves, and marine wildlife. 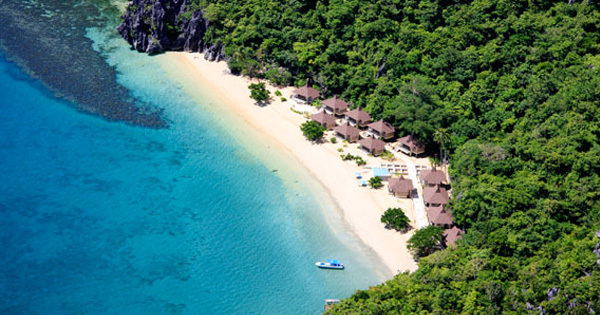 While daring travelers would prefer experiencing Caramoan by camping on its shores, some would love to stay at cozy and beautiful beach resorts. #1 - Tugawe Cove Resort: Get your well-deserved R&R in this upscale resort complete with luxurious facilities. Each of their rooms has a breathtaking view of either the hills, lake, or sea. The resort also features amenities such as an in-house restaurant, infinity pool, and complimentary activities such as kayaking, snorkeling, and kayaking. Its location is also very ideal for island-hopping. #2 - Hunongan Cove Resort: Surrounded by powdery white sand, cobalt blue waters, and lush green forest, with no cable, internet, and cellphone signal, you will surely find the definition of paradise in this resort. Developed and run by the local government of Camarines Sur, you can expect excellent service and accommodations perfect for your ultimate getaway. #3 - Gota Village Resort: You have got to go to Gota and make the most out of your Caramoan trip! Known as the place where the Survivor crew stayed at when they were filming, this resort that is also managed by the Cam Sur government is truly world-class. The place indeed looks like a small village with clean and comfy wooden cabanas. They also offer different marine and extreme activities. #4 - Hacienda Lahuy Island Resort: Get captivated by the sound of the waves and the rustic island living that this resort offers. They feature fan cottages and rooms at a reasonable price. What's more, they have four-walled tents with folding beds that will make you experience luxury camping by the shore. They also have all-inclusive packages for a worry-free vacation.